Vascular smooth muscle, which is located in the tunica media layer of the vascular wall, is the primary player to enable the blood vessel to constrict and dilate. This is fulfilled by the interaction of thin and thick filaments of the contractile apparatus. These filaments in the smooth muscle are organized differently from striated muscle, termed side polar geometry. Such an arrangement gives the blood vessel high adaptational capacity in contractility. Several cell organelles including sarcoplasmic reticulum, mitochondria, caveolae, and cytoskeleton are indispensable for the contractile functionality, which are involved in the regulation of cytosol calcium level, ATP generation, signal transduction, and cell shape adaptation in response to the contractile status. 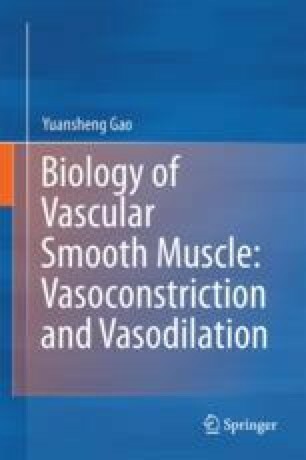 In this chapter, the current understanding of the ultrastructural characteristics of these cellular components of vascular smooth muscle will be reviewed.